Tanaka was born in Fukuoka prefecture and received an MA in aesthetics and art history from Tokyo University of the Arts. She studied Gidayu recitation with Gidayu recitation artist and Living National Treasure Komanosuke Takemoto, and became a disciple of the Gidayu-shamisen master, the late Kinshi Nozawa who was also a living national treasure in Bunraku Puppet Theater. 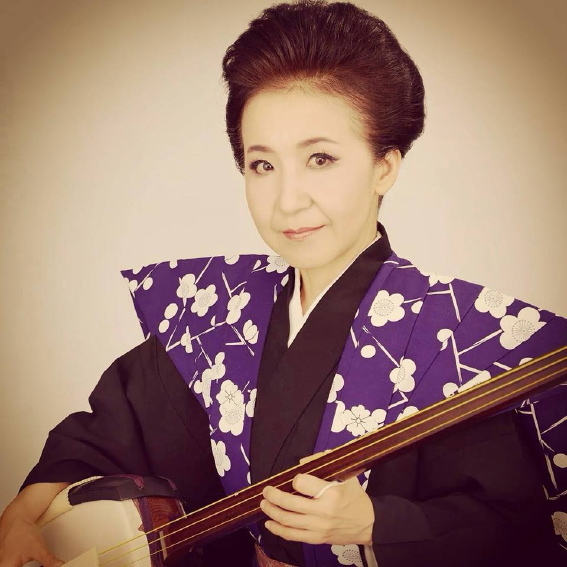 Since her debut performance in 1981 in Tokyo, Tanaka has been very active as a Shamisen player and vocalist, not only in the world of traditional Japanese music, but also in contemporary music, new music, and various styles of theater. In 2009, she became the general holder of Important Intangible Cultural Property as a member of Gidayu-bushi Preservation Society. Her credits range from performing with orchestras, such as Saint Louis Symphony Orchestra, the New York Philharmonic, Tokyo Metropolitan Symphony Orchestra, to collaborating with pioneers in the world of jazz and experimental improvisation, including turn table player Otomo Yoshihide; guitarists Keiji Haino, Kazumi Watanabe, Elliott Sharp, John Russell, Kazuhisa Uchihashi, Seiichi Yamamoto; drummers Samm Bennet, David Moss, Tatsuya Yoshida, Sabu Toyozumi ; laptop musician Carl Stone; sax players Ned Rothenberg, John Zorn, Akira Sakata, Kazutoki Umezu, Naruyoshi Kukuchi; electronic musicians Toshimaru Nakamura, DoraVideo, Aki Onda; and conductor Butch Morris. She premierd new pieces composed by Michio Mamiya, Yuji Takahashi, Michio Kitazume, Hikaru Hayashi, Sachiyo Tsurumi etc. Tanaka has participated in several contemporary music groups, including the traditional Japanese instrumental ensemble Pro Musica Nipponia,; the all-Japanese-classical instruments group ITO, produced by composer Yuji Takahashi; and the band Ground-Zero led by turntable and guitar player Yoshihide Otomo. She has performed in numerous notable venues, including Avery Fisher and Carnegie Halls, and has toured all over the world, including Korea, Italy, Serbia, Austria, Scotland, Belgium, Taiwan, Australia, Oman, Iraq, Turkey and England. She has soloed at a number of international festivals and has performed in the critically acclaimed musical theatrical spectacle Hashirigaki, directed by Heiner Goebbels. Since its premiere in 2000 at Théatre-Vidy in Lausanne, Switzerland, this work has been performed all over the world, including the Edinburgh International Festival and BAM in NY in 2003. She composed and performed for the theater piece Dogugaeshi by OBIE Award puppet artist Basil Twist premiered in NY in 2004, for which she received strong praise from The New York Times and other quarters, and the piece got The New York Innovative Theater Award and The Bessie's Awards in 2005, replayed in NY and toured to Japan in 2007, and also toured in the US in 2008, 2009 and 2012. She performed multimedia music performance "tayutauta" in Tokyo in 2010. In 2012, she participated in the world tour of "Overcoming the Disaster, Gratitude from Japan to the World concert by Tohoku Folk Performance groups & Ondekoza Taiko group & musicians" under the auspices of the Japan Foundation, and performed at Jazz at Lincoln Center and UN Headquarters in New York, at Ahmanson Theatre in Los Angeles, and at Palais des Congrès in Paris, and so on. She had a shamisen workshop at Japan Society NY in 2013, and performed traditional Gidayu-bushi with the national treasure of Gidayu chanting Komanosuke Takemoto, and perform improvisation with to the silent film Crossroads (Jujiro, 1928) film by Cannes Film Festival Palme d'Or winner Teinosuke Kinugasa. She also performed solo improvisation as a member of MultipleTap with the experimental musicians in London in 2014, and will join in Mexico and Europe tour in 2015. She received the Education Minister's Art Encouragement Prize for Newcomers in 1990, and a fellowship from the Asian Cultural Council, which supported her residency in NY in 2006-2007 to research current developments in contemporary performing arts in the US. In 2008, she became a grantee of Japanese Government Overseas Study Program for Artists, and stayed in NY for 80 days to learn about the puppetry under the master puppeteer Basil Twist. You can listen to her music instrumental improvisation listen to her music on CD Tayutauta released from Improvised Music from Japan in 2004. 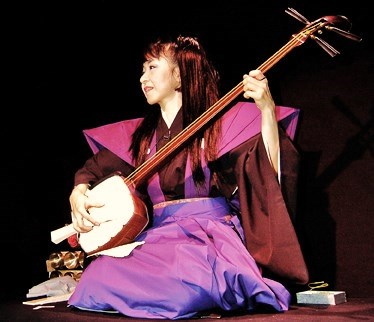 And she published a book titled Marugoto Shamisen no Hon (The book entirely about Shamisen) in 2009 .